Malaga wine might not have quite the same pizzazz as Rioja or Ribera and many restaurants in Malaga don’t even feature it on their menu. But wines from all over the province are slowly making their mark and gaining international awards. Unsurprisingly, wine tasting in Malaga is fast becoming a popular activity. Guide to Malaga recently joined a wine tasting in Malaga and discovered some new names in the local tipple. This blog post describes what you can expect at such an event and where you can go in the city to taste Malaga wines. Our wine tasting experience took place at La Odisea Vinos on the Plaza General Torrijos at the end of the Plaza del Parque. This unique and atmospheric venue is in the only house that still stands in the historic La Corracha district in the foothills of the Gibralfaro Castle. 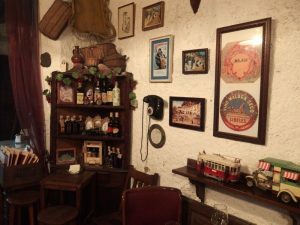 It’s historic on the inside too and each of the small rooms is crammed pack with memorabilia, both alcoholic and non-alcoholic. Lining the wall in one room are Malaga wine barrels – these are mostly sweet and you can taste them on tap – while opposite them are antique pictures, ornaments, vintage phones, retro bikes… Don’t miss the Civil War refuge in a small tunnel at the back of the house in the small patio. Malaga wines are best known for their sweetness and high alcohol content. Those made from Pedro Ximénez and Muscatel grapes come in at around 15 per cent. Most of this type of Malaga wines are produced in the Axarquía region. Those of us on the wine tasting expected sweet wines so it was a surprise to try the first on the list. 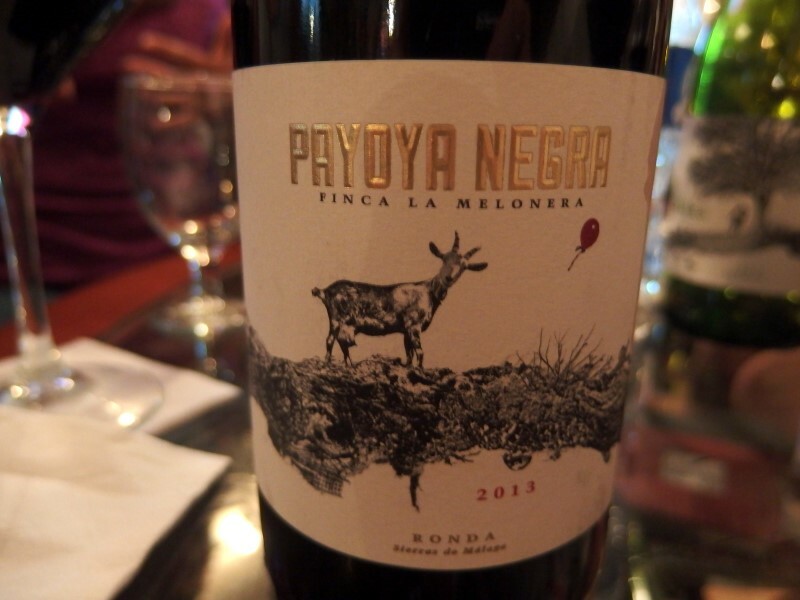 First up was a white from Ronda from Finca La Melonera bodega. Called Encina del Inglés in honour of an oak tree planted on the estate by an English man back in the 18th century, this wine was both sweet and salty. A real surprise on the palette caused by a mixture of Pedro Ximénez (sweet) and doradilla grapes (saline). This went perfectly with Payoya goat’s cheese with caramelised onion. We then tried the red equivalent of the same wine, an Encina del Inglés bottled in 2013. This had a fruity, oaky taste that paired well with the porra antequerana (thick tomato soup) that came with it. Fans of red wines were in for a treat with the next wine on the list and this was the all-round favourite among those attending this wine tasting in Malaga. Called after the same goat, the Payoya Negra wine was a combination of Garnacha, Shiraz and Tintilla de Rota grapes, all organic. This is altogether a darker and smoother wine than the Encina del Inglés (reflected in its price since it retails for around €18). You maybe wouldn’t have thought of pairing it with a spicy king prawn but we did and the taste combination was exceptional. The final wine in the tasting was from the renowned Botani label, produced by the Jorge Ordóñez bodega. 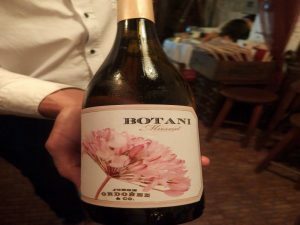 We tried the latest Botani to enter the market, part of the sparkling line and called ‘frizzante’. The grapes are grown in the area around Vélez-Málaga on steep slopes. Donkeys are the only form of transport that can reach the harvest so this wine has a real traditional touch to it. As with all Malaga wines from the Axarquía, this Botani was sweet but the bubbles took away some of the sweetness making it extremely palatable. La Odisea Vinos organises Malaga wine tasting by appointment. Food and wine pairings start at €20 per person. If you don’t want a wine tasting but want to try Malaga wines, choose one from the wine list and accompany them with the long list of tapas. On the Alameda Principal this is one of the best-known places in town to try Malaga wines, in this case all sweet. They’re kept in the barrels that line the small venue on both sides – you choose your tipple and the bar man will fill your glass. This old bar (it dates back to 1840) doesn’t serve much in the way of food (cold tapas such as cheese and prawns only) and there are no seats, but it’s atmospheric and enjoyed by locals as well as tourists. This lovely bar and restaurant on Calle Beatas is known for its long, long list of wines including several produced in Malaga. You can try by the glass – there’s an unusually good choice and at reasonable prices – book a wine tasting session (by appointment) or join one of the regular wine and food pairing events. See the website for details. This is also one of the best tapas restaurants in Malaga (it features as 1 of the 5 best gourmet tapas venues in our Guide to Malaga). On Calle Victoria (there’s a great craft beer venue just nearby for the non-winos in your party), Maineke offers wine tasting events in Malaga as well as other tastings such as Malaga gins. The tastings are usually pairings (tapas here are excellent) and take place once a month. They also run an online shop with a good choice of wines, olive oils, cheeses and other gourmet products. Keep up-to-date with the Malaga wine scene – sign up for our free fortnightly newsletter. All you need to know in your inbox every other Friday.